A year ago, I received a manuscript by email. I liked it immediately. Vivienne was the main character and she was fun, full of energy and messy. The next day they told me, she could be any animal that I wanted. Oh, the possibilities! I saw Vivienne morph from a cute little fox to an artsy cat to later become a hairy javelina. Kind of like an inverted caterpillar to butterfly evolution but oh, I loved that javelina! She had an attitude and hair to donate to the masses. The Editor and Art Director liked the javelina as well and requested two changes: loose the tusks and hair. And as you can imagine, we ended up with a piggy. Capstone liked the colors from my colored pencil pieces and the textures from my mixed media work so I ended up mixing both techniques for the book. Final results were illustrations done with colored pencils and acrylics over different textured backgrounds with some collage elements on Canson Bristol Vellum 100mg. Some illustrations had textured backgrounds that covered the whole piece while others only had texture as accents – like you can see below where I only added texture to the grass. The best example of the collage elements I used in the book is Vivienne’s cute denim dress. It was done with real denim – my denim shorts. In the picture below you can see the title page and endpapers and it shows how I used the fabric in the book. A few of the illustrations that are included in the book. I can’t wait for all of you to see the book but in the meantime a few images of the interior pages of “The Messy One”. A downloadable, free coloring page from a sketch not included in the book and an easy button to order your copy. Almost to the giveaway time! 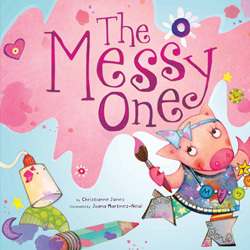 This is my first GIVEAWAY ever and you will get a copy of “The Messy One”. To enter just drop a comment below. On October 3rd, a winner will be randomly chosen. Don’t forget to include your contact email on the comments so I can get in touch with you. I am new to your blog,and so glad that I found you!!!!!!! !Oh, I truly enjoy viewing your new book along with your wonderful sharing about process with creating this book. You have a really unique style and creativity when it comes to create a children book . I must say that I love your color pencil arts so much because I love how your illustrations are so tender,and warm! It is a great insights and informations about how to create a children book. I have learned so much!!! Also, I love how you combined the mix media along with collage on Vivienne’s outfit. They all fit just perfectly!!! It’s time to spread this wonderful book to everyone I know!!!!!!! I think this is going to be my favorite (so far ;-) Love the denim endpages! Oohh fantastic, Juana! I really love your character and the illustrations look wonderful! Thanks for sharing some bits of your process! And I surely want to enter your giveaway! Que lindo esta el libro!! More please… ! First off congratulations on a quite extraordinarily beautiful book. My initial impression was being struck by the lively soft colourc pallette which has the result of a very comforting charm to your work. Your characterisation is excellent, i was a messy one, with my habit of painting and drawing all the time, whilst i haven’t read the book, i very very much want to. I think your work is very inspiring, and it’s so great that you share your techniques. I too am a huge fan of watercolour pencils and the many exciting colours available. I used them to creat my tiger and strong bear on my site. Thank you very much for sharing, it would be an honour to have a copy of your book, but if not, good luck with everything you do and keep up the beautiful work. I’m sure your book will be a huge success, the compositions are delightful and really drew me into the page i’m sure children everywhere will feel the same. I love your illustrations. They are so very whimsical and colorful. My little girl would love this book! Hooray for giveaways! congratulations on a beautiful book! This is a great book. I can’t wait to see it in print. Include me in your contest for the give away! Juana – this is truly a work of art!!! I love it. Vivienne is adorable..I love her boots and oh my goodness, the textures and the denim and collage work is gorgeous. Your work is simply top-notch. Thank you for the chance at the giveaway..and if I lose, I will be ordering a book straightaway.. : ) Super duper congratulations and I know this will be a hit! When does it hit the bookstores? Thank you all! I appreciate the comments very, very much. This book is beautiful, but so is everything you do! Great post! Congratulations Juana! You’ve always been so talented! I’m really happy to see your final product… love your blog! Success & more success! Wow what a great post Juana! Thanks for sharing the process of your beautiful book. Thanks for sharing your work and process, Juana. You’ve created really beautiful, lively, fun illustrations. And thanks for the giveaway. Fingers crossed! This book is beautiful! Great work Juana, congrats! I love your details on process. It is good to hear how you did mixed media with colored pencils. I am coming up with questions on how to do more with colored pencils. Your illustrations are wonderful. Juana Congratulations! It would be great to have a copy of your book in my hands. I said it on G+ and now I’m saying it again, you’re an inspiration to beginning illustrators. Keep up the good work. We’re all looking forward to what other projects you do. Las ilustraciones te han quedado muy bonitas, el personaje es adorable. Las texturas, las técnicas que has empleado, me encantaron. Te felicito. I have my own little messy one at home so this book would me a great addition to our collection. Thanks for the giveaway and all of the coloring pages you post. Oh, my little girl loves pigs! Your work is truly amazing, so glad your friend Dariela suggested the sight via twitter! Yay! Congrats Juana, your book looks amazing!! Hi Juana! It is really nice to see your blog, I was surprised with your illustrations. Congratulations for that. I’m a tutor and a children’s teacher, then it should be wonderful for me to gain the book. Good Luck in your next projects. Juana, your work is beautiful! Can’t wait to see this new book! The book looks awesome! Congrats and thanks for sharing the process. Hello Juana, I love your work! Thank you so much for sharing more about the techniques you used, I always find it fascinating to learn more about how other illustrators work! Congratulations with your latest book and I hope there will be many many more! He encontrado tu blog gracias al post de Illustration Station y dejame decirte que me ha encantado tu trabajo de creacion de personajes y del entorno de los mismos. Y el toque de lo de los jeans me parece genial. Me gustaría que me consideraras para la rifa de la copia de tu libro. Aqui te dejo la liga para mi blog. What a cutie patooty! I have little girls that would groove on her style! Looks like a winner! Felicitaciones Juani!!! tu libro esta muy bonito tanto ilustraciones como el cuento, estoy segura q a los niños les va a encantar tambien, si no tenemos la suerte de ganarnos uno en el sorteo, nos daremos un salto a Amazon. I bought this book & reallty love it! I also bought Lellie because I love your colors/illutrations in that book too. I love her toys, and all of your techniques! You illustrated her cute personality wonderfully! Please count me in on the giveaway! I want it I want it I want it!!! Your books and illustrations are simply gorgeous! Thanks for doing this giveaway! I’m such a fan of your work. It’s always so full of life and so very vibrant! Juana, it’s gorgeous! Congratulations. I can’t wait to read it. It is a pleasure to see such happy illustrations.The colors and mixture of mediums you used are so inspiring. What nice !!!! my friend !!!! be a succes for sure. Querida Ju, te felicito de todo corazón, me siento muy orgullosa de tener una excelente amiga y además tan talentosa. El libro, por tus adelantos, se ve fantástico, como siempre, tus ilustraciones me encantan. !Muchos éxitos más!. Ay, amega! Como se te extranha y como se te quiere. Un beso q llegue hasta alla. Congrats, Juana :D Lovely illustrations and textures :) The piggy doll is cute btw. All the best. I love how even messiness can be celebrated! Your illustrations have so much life in them- I look forward to reading your book! They got a second edition with a different cover. I should get a couple of those books and give you one.